TUPELO, Miss. 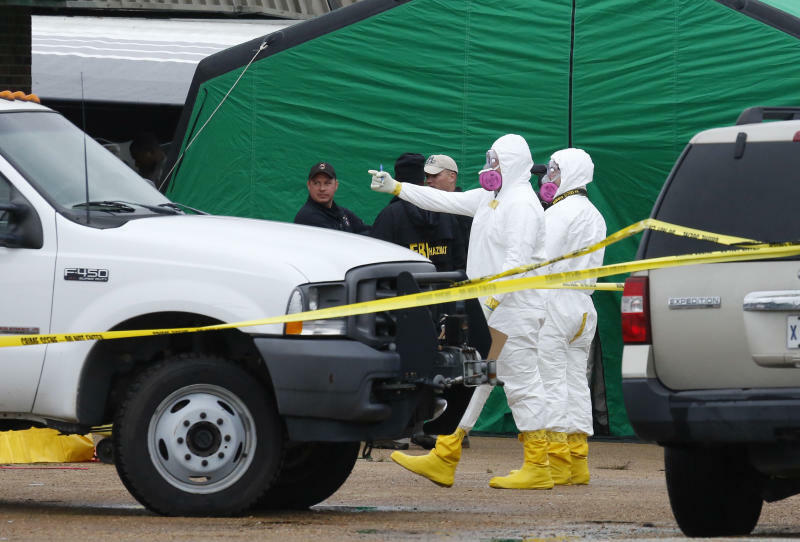 (AP) — Of three ricin-laced letters mailed this month to public officials, only one made it into the hands of an intended target, 80-year-old Mississippi judge Sadie Holland. Investigators are working to piece together what motivated someone to send the letters to her, President Barack Obama and U.S. Sen. Roger Wicker. Holland is a common link between two men who have been investigated in the case. Holland presided over a 2004 assault case against Paul Kevin Curtis, an entertainer who had been the top suspect in the case until prosecutors dropped charges against him Tuesday. And her family has had political skirmishes with Everett Dutschke, the Tupelo man whose home and former place of business have been the subject of searches by investigators for two days this week. No charges have been filed against Dutschke. The judge's son, Steve Holland, is a partner with her in the funeral home owned by the family. "I've often said she could sentence someone to hanging at the courthouse square at 12 noon and they'd say 'Thank you, Miss Sadie,' " Steve Holland said. The family is deep into Mississippi politics. Sadie Holland has been a Justice Court judge for 14 years. Steve is a state representative and his wife, Gloria, is mayor of the town of Plantersville. Another of Sadie Holland's sons, Billy Joe, is a member of the Lee County Board of Supervisors. Steve Holland said he believes his mother's only encounter with Dutschke was at a 2007 rally in the town of Verona. Running as a Republican, Dutschke lost a lopsided election to Steve Holland that year. Holland said his mother called out Dutschke after he made a derogatory speech about the Holland family. "She just got up and said 'Sir, you will apologize. This is where I was born in Verona and we've been here five generations and you will apologize.'" Steve Holland said Dutschke altered a photo to make him look like the fictional Boss Hogg from the "Dukes of Hazzard" TV series, portraying Holland in a white suit and hat with a big cigar. "He'd just go off on a tangent about 'Boss Holland is a thief' and 'Boss Holland has been stealing from you people' and 'Boss Holland this' and 'Boss Holland that,'" Holland said. Presley, a Democrat, said he doesn't recall details of the speech — just the tone of it, and the crowd's reaction. "I just remember everybody's jaw dropping," Presley said. He said he also remembers Sadie Holland chastising Dutschke afterward. Dutschke said his speech included sharp criticism of Steve Holland's record in public office, but that Holland had overstated the incident. And he told the AP on Tuesday that he has no problem with Sadie Holland. "Everybody loves Sadie, including me," he said. Steve Holland said he doesn't know if his mother remembers Curtis' assault case. She was presiding judge in a case in which Curtis was accused of assaulting a Tupelo attorney in 2003. Holland sentenced Curtis to six months in the county jail. He served only part of the sentence, according to his brother. Sadie Holland declined an interview with the AP. Steve Holland said his mother insists on opening her own mail at the court and called the Lee County sheriff after reading the threat and deciding the letter "didn't smell right." Holland said his mother has been trying to go about her daily routine and ignore the hoopla, saying he saw her driving a tractor home about sundown one night this week. Instead of talking about the investigation, Holland said his mother wanted to talk about planting new grass in the family graveyard. "She's fiercely independent," Holland said. "Mother doesn't want the FBI or anyone else here. She just wants life back to normal." Curtis, 45, was released from a north Mississippi jail Tuesday and charges against him were dropped, nearly a week after authorities charged him with sending the poisoned letters. By the time Curtis left jail, authorities had descended on Dutschke's house in Tupelo and conducted a search that lasted for hours. Dutschke told the AP on Wednesday morning that he and his wife had gone to a friend's house because they didn't feel safe at their home. Later Wednesday, dozens of investigators were searching a small retail space where neighboring business owners said Dutschke used to operate a martial arts studio. Officers at the scene wouldn't comment on what they were doing. 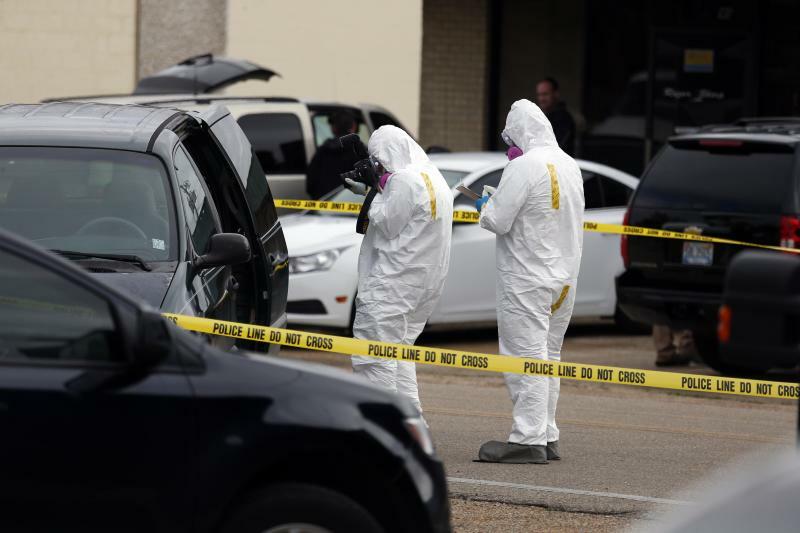 Investigators in gas masks, gloves and plastic suits emerged from the business carrying 5-gallon buckets full of items covered in large plastic bags. Once outside, others started spraying their protective suits with some sort of mist. Dutschke was seen outside the studio observing the search. 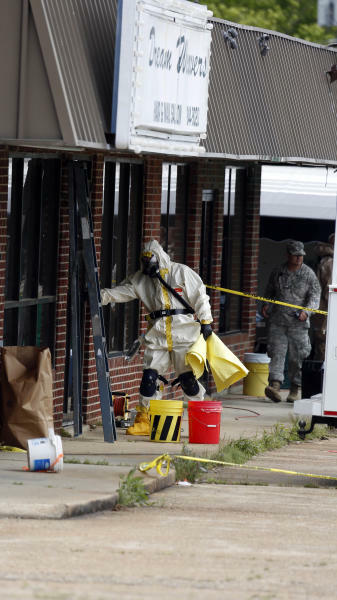 Wednesday evening, hazmat teams packed up and left Dutschke's business. A woman drove off in a green Dodge Caravan parked on the street that had been searched. Daniel McMullen, FBI special agent in charge in Mississippi, declined to speak with reporters afterward. Dutschke's attorney, Lori Nail Basham, said Dutschke is "cooperating fully" with investigators and that no arrest warrant had been issued. Curtis, who performs as Elvis and other celebrities, describes a bizarre, yearslong feud with Dutschke, who insists he had nothing to do with the letters. But Dutschke decided not to publish the material, Curtis said, and later began stalking him on the Internet. Curtis acknowledges posting a fake Mensa certificate on Facebook, but says it was an online trap set up for Dutschke because he believed Dutschke was stalking him online. He knew Dutschke also claimed to be a member of the organization for people with high IQs. Dutschke had a Mensa email address during his 2007 legislative campaign. "The last email I got from him, was, 'Come back tomorrow at 7 and the results of you being splattered all over the pavement will be public for the world to see what a blank, blank, blank you are,'" Curtis said. "And then at that point, I knew I was dealing with a coward." Hal Neilson, who is a former FBI agent and one of the attorneys for Curtis, has said there was a list of people who may have wanted to hurt Curtis and that Dutschke's name came up. Efforts to reach Curtis, his lawyers and his brother were unsuccessful Wednesday. Speaking on NBC's "Today" show Thursday, Curtis reiterated his lawyer's assertion that he had been framed. He said he had a hunch who framed him, but he did not mention Dutschke or anyone else by name.